Human: Fall Flat, a game about Bob and his wild dreams, is bound for the Nintendo Switch eShop on December 7th, 2017. Bob is a regular human with no superpowers, but given the right tools, and using the right physics, Bob might get more than just the job done! Players will be able to create their own lobbies, invite their friends and watch multiple Bobs wobble, stumble and create havoc in the physics based dream worlds of Human: Fall Flat. 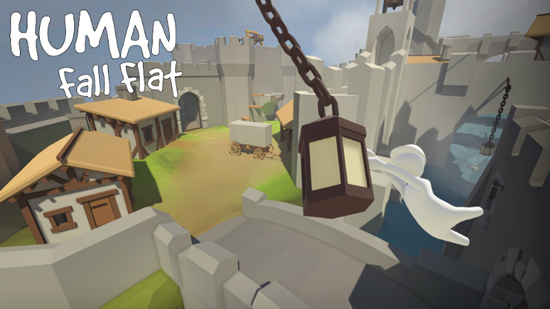 Human: Fall Flat puts players in the shoes of Bob, who keeps having dreams about falling. Bob finds himself wandering through surreal, floating dreamscapes, each of which requires solving various physics-based puzzles. This is not an easy task for a human with zero superpowers, but with the right tools he can do a lot… and misusing those tools he can do even more. Advanced physics and innovative controls set the stage for a wide range of interesting challenges. Bob’s dreams of falling are riddled with puzzles to solve in as many ways as you can dream up, as well as plenty of distractions to just mess around with, offering hours of unique gameplay. Will you try to open that mysterious door, or would you rather see how far you can throw a speaker set out that window?